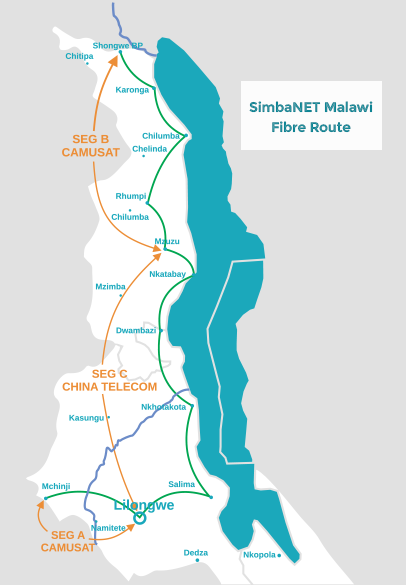 DataCom connects to the international world through SimbaNET Malawi a company that was registered in Malawi in 2014 and is in a public private partnership with the Government of Malawi through the Public Private Partnership Commission with the aim of increasing investment in fiber infrastructure, increase competition and lower the cost of International bandwidth in Malawi. SimbaNET’s Cable Landing Station “the Virtual Landing Point (VLP)” is in the Government enclave at Capital Hill in Lilongwe. Through the VLP, they are able to deliver IP transit (regional and international) as well as IPLC circuits. The VLP is fully redundant with multiple links to global peering points and is housed in a facility that meets global Tier-2 data center standards of cooling, power backup and security.